The Buddy Bike a Product of Love The Buddy Bike helps to improve family lives, and as Tim from Naples, Florida states, “We have worked on pedaling several times a week. On April 3, 2007 everything came together and now Cole is able to pedal! Our family and many of the neighbors are overjoyed at his accomplishment as they know how hard we have worked on pedaling. Cole is nonverbal but now appears to enjoy riding his Buddy Bike even more now. We are so happy and proud for him and just want to thank you again for providing a wonderful product like the Buddy Bike that has allowed my son a chance to participate in an activity that only a year ago seemed impossible.” The creation of this bike is in itself a gift of love for a child, and Buddy Bike has continued that fountain of love since its beginnings as a Love Bike. The Buddy Bike provides families with special needs children, with the means to go out for a physical activity as a family. The Buddy Bike is a similar means of transportation like the tandem bike, but allows families to feel safer with their children. This bike in particular enables children with special needs to learn how to communicate, and allows parents the opportunity to help their children in rehabilitation. The future of Buddy Bike holds a lot in store including: newer versions of the Buddy Bike and more Buddy Bike clubs and group rides. Buddy Bike offers children with special needs the opportunity to feel like any other child, and helps impact the family towards a better future. Buddy Bike started out with a simple ride between a parent and their child Jesse, diagnosed with autism, and is a product of a father’s love for his son. Barry Nelson, Jesse’s father, believes strongly that his children need to exercise both their brains and their bodies, and loves to take his children on bike rides (The Buddy Bike). But before discovering the Buddy Bike, Nelson rode a Tandem bike with his family, but could not keep a constant watch over his son Jesse. Many times Nelson would end up crashing on the Tandem bike when turning around to observe if Jesse was pedaling correctly or if Jesse was okay while biking through the Everglades (The Buddy Bike). On November 29, 2003, Nelson purchased a used Tandem bike, called the Love Bike, where the child sits in front and the pedals of the front seat rider are connected to the gears, while the same handlebars are used for the person sitting behind the front rider (Jesse and the Buddy Bike Story). Nelson and Jesse enjoyed riding the bike so much that Nelson contacted the inventor, Robert Gardner, to buy the patent for the bike. Robert Gardner’s Love Bike from then on became known as the Buddy Bike (Jesse and the Buddy Bike Story). “Basically, Buddy Bike exists today because of the love of two fathers for their sons” (Shelley Patterson). Tandem bikes have a similar structure to the Buddy Bike; however, the Buddy Bike gives families with children a safer way of observing and instructing their children how to use the bike. Unlike the Tandem bike where the person in front steers the bike, the rear rider on the Buddy Bike controls the steering, shifting and braking on the bike (Bike Specs). The front rider on the Buddy Bike has a smaller set of handlebars, and gets to feel the movement of the Buddy Bike, and has rear braking capability (Bike Specs). Not only are the handlebars controlled differently on a Buddy Bike versus the Tandem bike, the handlebars also can be adjusted with both sets of handlebars (Bike Specs). The set of handlebars designed for the rear rider can move up and down, while the set of handlebars designed for the front rider can move backwards or forwards depending on the reach capability of the rider (Bike Specs). The Buddy Bike in comparison to the Tandem bike has a more compact frame, allowing easier maneuverability when steering Bike Specs). Tandem bikes require two people to operate, but a Buddy Bike can be operated with either two people or one person (Bike Specs). And just like a Tandem bike, the Buddy Bike uses adjustable seats to fit riders of all heights. The Buddy Bike featured right now on the market is a Shimano seven-speed Nexus enclosed hub bike capable of pedaling through a comfortable range of terrain or hills (Bike Specs). Another option the Buddy Bike provides that a Tandem bike can’t is the ability for children who cannot reach the pedals, to use optional fold out foot pegs that attach to the frame of the Buddy Bike (Bike Specs). This bike in particular gives children the opportunity to ride with their parents even when they are still too short to reach the pedals. 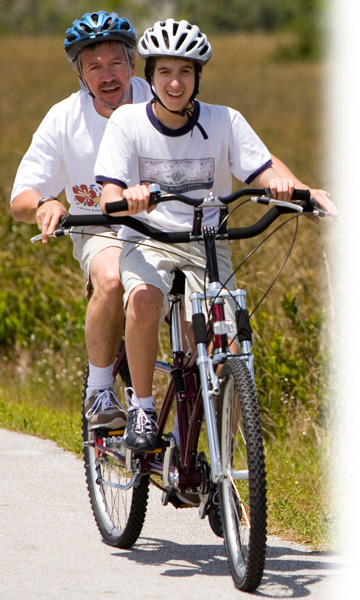 The Buddy Bike unlike the Tandem, allows children of all ages to enjoy a two person bike ride, while feeling in control of the bike when seated in the front. The Buddy Bike offers a family the perfect bike for all ages, and pays back in love each time the bike is used. One crucial difference stands between the Buddy Bike and a Tandem bike, and that is the miracle the Buddy Bike has brought to families with special needs children. An activity such as the Buddy Bike is an incredible way of working with autistic children. According to the National Institute of Neurological Disorders and Stroke (NINDS), “Autism is characterized by impaired social interaction, problems with verbal and nonverbal communication, and unusual, repetitive, or severely limited activities and interests.” For an autistic child to be able to learn better communication skills and physical activities, the Buddy Bike can be considered a miracle towards rehabilitation with children. The Tandem bike does not provide the same connection a Buddy Bike does in relation to verbal and nonverbal communication as well as the physical activity of biking. One feature that is lost with the use of a tandem bike is the ability to have a conversation or communicate within a close range of a partner. A couple in South Africa, Dawn and Colin, who bought a Buddy Bike says, “With the Love Bike [Buddy Bike], the two of us sit close enough together that we can have a normal conversation on the move without turning heads and shouting into the wind. Synchronizing our pedal action has proved to be no problem at all, in fact, it adds to the sense of togetherness while cycling as we communicate our intentions when cycling around corners etc” (Customer Comments). The Buddy Bike unlike the Tandem allows for closer connection between two people, allowing a way to provide verbal encouragement. With a bike where two people are riding communication is essential especially when biking involves children with special needs. The Buddy Bike is advertised as an easier means for both riders to connect, and communication and connection are important when biking with loved ones. Buddy Bike allows children with or without special needs to feel in control when riding a Buddy Bike. Howard, a father in Florida, comments about riding the Buddy Bike with his children, “Since they are right in front of me, we can easily have a conversation while riding. They really enjoy being up front, able to see and feel like they have some control” (Customer Comments). Children now can see what is in front of them, rather than seeing their parent’s back. Riding in front allows the kids to be open to the world around them. Children rarely get the chance to feel in control or in charge, and with the Buddy Bike get a sense of control. Samantha Nelson, Jesse’s older sister stated in the article “The Buddy Bike” in the magazine “The Autism Perspective”, “Jesse not only pedals, he also helps my dad steer, pointing and saying “right turn” or “left turn” as they ride around the familiar route. Instead of just seeing his dad’s back, Jesse now sees the whole world before him, though he often looks back at my dad with a big smile on his face.” Children like Jesse, with special needs, can feel in charge when riding a bike, and with the Buddy Bike can learn how to pedal and speak in conversation.” Jesse can interact with the world rather than go along for the ride. In this sense children can direct where they want to go, and can see where they are going, while having the power to change command a change in direction. For parents the Buddy Bike is a godsend, allowing parents to keep an eye on their children while permitting parents to keep their eyes on the road. In New Jersey, Mary, a mother of an autistic child says, “When we looked at tandem bikes we weren’t thrilled with the design. The thought of Connor being behind one of us left us uncomfortable. How could we monitor his participation without biking into a tree? The Buddy Bike seemed like a perfect fit and so far it has been. Connor has already mastered keeping his feet on the pedals as well as increased his improvement in steering” (Customer Comments). The Buddy Bike is a perfect fit for families who want to be able to keep an eye on their child at all times during a bike ride. Shelley Patterson, a marketing specialist for Buddy Bike, commented that parents with special needs children say that as a result of the Buddy Bike, “their children are more receptive and communicative after riding their Buddy Bike. Others say that their children are non-verbal and yet they can say “bike or “bike ride”. Some parents talk about their children being more cooperative around the house or concentrating more their homework to gain more time to ride their bikes and have that family time together.” In the case of special needs children, parents need to keep a closer eye on their child, and the Buddy Bike gives this capability, helping the parents feel closer to their child. On the Buddy Bike, the closeness of the riders lets the parents feel closer to their child while being able to instruct their child on how to bike, and watch the amazing changes their child goes through as they experience the gift of a bike ride. With the Buddy Bike the parents of autistic children do not have to worry about the safety of their child, and whether or not the child is pedaling properly behind them. Along with the miraculous gifts the Buddy Bike offers families, Buddy Bike’s goals expand past just the families who purchase the bikes. The future of Buddy Bike clubs includes the plans for group rides and local excursions for dads or moms with their children. Shelley Patterson stated three different goals for the Buddy Bike, “1) To promote cycling and bring the cycling experience to families who might not otherwise be able to ride a bicycle. 2) To bring the Buddy Bike to as many special needs families as possible. We attempt to do this by offering a reduced rate for the parents of special needs children and to non-profit organizations that benefit the special needs community. We also donate or offer bikes at cost to several non-profit organization groups each year. 3) To open Buddy Bike shops across the country where people can rent Buddy Bikes and go on guided tours.” The goals and hopes of Buddy Bike include the creation of clubs throughout the United States, the creation of newer bike models for lighter transportation, and the opportunity for children with special needs to grow in their development, exercise and interact with their community. Buddy Bike in 2008 will be offering the newest generation of Buddy Bikes. In 2008, customers will be able to choose between the Buddy Bike Family model and the Buddy Bike Sport model. Both the Buddy Bike Family and the Buddy Bike Sport Model will have aluminum frames and shorter bike length for easier bike loading and lighter rides. The Buddy Bike Family model will offer a lowered rear seat for smaller captains, similar seven speed Shimano Nexus Hub like the Buddy Bike model, and top tubes allowed for mounting ease (Buddy Bike Quality Time Quality Bike). The Buddy Bike Sport model meanwhile will feature increased leg room for the taller rear rider and a 24 speed Shimano Nexus Hub, eight external and three internal (Buddy Bike Quality Time Quality Bike). Buddy Bike Sport will offer a “wider range of gears for better climbing, a suspension fork and hybrid tires for a smoother ride with less rolling resistance” (Buddy Bike Quality Time Quality Bike). The Buddy Bike expands its sights on giving a wider variety of bikes to families with different interests in bikes. In 2008, Buddy Bike will bring two new bikes for families to choose from, giving even further to the families who purchase a bike. Today Buddy Bike has outreached to numerous groups of families, schools, and organizations. The target audience of Buddy Bike includes, “1) special needs families, schools, camps, organizations; and 2) bike shops that offer bicycle rentals and cycling tours in scenic, tourist locations” (Buddy Bike Quality Time Quality Bike). Buddy Bike does not only concentrate on special needs families, but to anyone who would enjoy using the bike. Several schools and organizations use the Buddy Bike “including: The Victory Schools for Children with Autism in North Miami Beach, Fl; Junior Blind of America in Los Angeles, CA; Harbor Haven Day Camp in West Orange, NJ and Alexandria City Public Schools in Alexandria, VA” (Buddy Bike Quality Time Quality Bike). Since the start of Love Bike to today’s Buddy Bike over two hundred and fifty bikes “have been sold in the United States, Canada, Australia and the United Kingdom” (Buddy Bike Quality Time Quality Bike). Buddy Bike’s purpose is to aid families with special needs and provide an entertaining way to ride a bike with a partner. Communication and connection are prevalent with using this bike, giving room for encouragement or coaching. With Buddy Bike, children who cannot normally feel in control can finally feel empowered. Parents with help from the Buddy Bike now can keep an eye on their children at all times while biking so that they do not risk crashing their bike. Parents can now watch their children, and see the joy the bike gives their child. Not only can parents see the joy on their child’s face without turning around as is the case on a tandem bike, a parent can have a conversation with their child without worrying about whether they were heard. Buddy Bike gives families a sense of togetherness, and a new way to experience life. Exponentially this bike gives back more to the families who purchase them then a tandem bike. The Buddy Bike started as a product of love, and produces love in return for everyone who gets the chance to use it. “Is this much fun from a Buddy Bike normal or legal? The children and I seem to have smiles from ear to ear” (Customer Comments). "Bike Specs." Buddy Bike Quality Time Quality Bike. 2005. Oct.-Nov. 2007. “Jesse and the Buddy Bike Story." Buddy Bike Quality Time Quality Bike. 2005. Oct.-Nov. 2007. Buddy Bike Quality Time Quality Bike. North Miami Beach: Buddy Bike, LLC, 2007. “Customer Comments." Buddy Bike Quality Time Quality Bike. 2005. Oct.-Nov. 2007. Nelson, Samantha. "The Buddy Bike." The Autism Perspective Summer 2006. Oct.-Nov. 2007. "NINDS Autism Information Page." National Institute of Neurological Disorders and Stroke. National Institutes of Health. 4 Dec. 2007. Patterson, Shelley. E-Mail interview. 29 Nov. 2007.